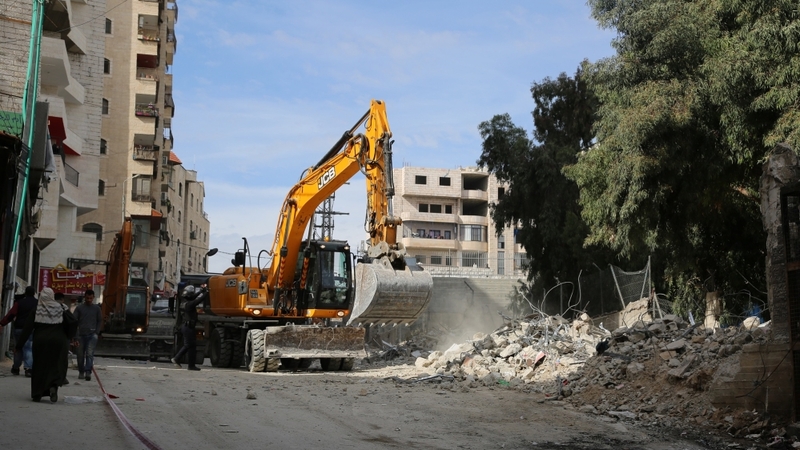 Shuafat refugee camp, occupied East Jerusalem – Three earthmovers continued to take away the debris of over a dozen Palestinian shops that used to line the street at the entrance to Shufat refugee camp in occupied East Jerusalem. Bulldozers tore through the mangled wire and concrete on Thursday, sending clouds of dust into the air as while boys and men watched from behind the red barricade tape set up by Israeli police. “Am I allowed to go through?” a seven year-old boy asked with a concerned tone at the site of the destruction. For others, it was just another day living under Israeli military occupation. “Only God can help us,” said a man observing the scene from a chair while having dessert. Shufuat refugee camp hasn’t been issued a single building permit since Israel’s military occupation began in 1967, forcing its residents to build illegally. 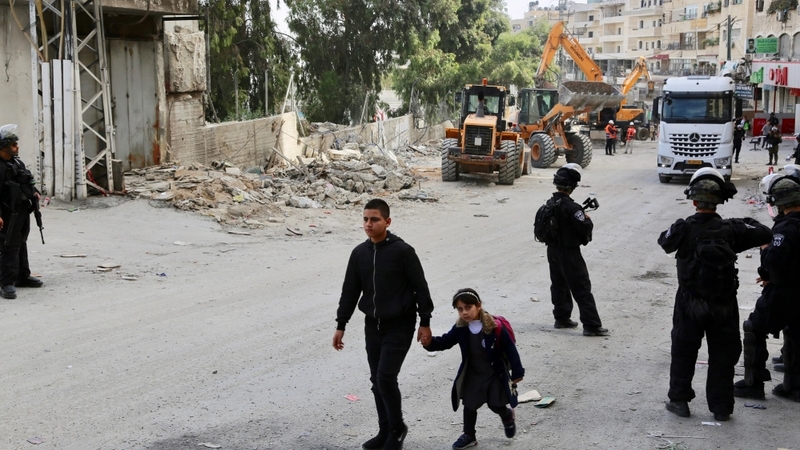 On Wednesday, Israeli forces entered the camp, sealed off its entry and exit points, positioned snipers on rooftops and began demolishing 16 shops, affecting the livelihood of more than 60 families. Demolition notices were issued to 20 Palestinian shops a day earlier. Israel regularly demolishes Palestinian homes and buildings, claiming they were built without Israeli-issued permits. This demolition was believed to be the largest by Israeli authorities since the camp’s establishment in 1965. The Palestinian Liberation Organization (PLO) slammed the demolitions on Wednesday, saying they were part of former Jerusalem mayor Nir Barkat’s plan to end Shuafat’s status as a refugee camp, oust UNRWA, the UN refugee agency and end the basic services it provides. Ahmad Abu Holy, head of the PLO’s refugee department, accused the Israeli municipality of West Jerusalem of waging war on the camp with the demolition “under the illegal pretext of building without a permit”. Holy added that the latest demolition was part of former West Jerusalem mayor Nir Barkat’s goal to change the “character of the camp” and oust UNRWA from the capital. Last month, Barkat announced plans to get rid of UNRWA’s services in the city to “end the lie of the Palestinian refugee problem”. He said that all services operated by UNRWA in East Jerusalem, such as schools, clinics and sports centres, will be transferred to Israeli authorities. It did not provide an exact timeframe, but said schools serving 1,800 students would be closed by the end of the current school year. Yara Hawari, PalestinePolicy Fellow at Al-Shabaka told Al Jazeera that Barkat’s statement to remove the camp’s refugee status is an attempt to “severe Palestinians from their land and turn them into residents with minimal rights that can be taken away arbitrarily”. “What is clear from this is that Israel is accelerating its plan to drastically alter the geographic and demographic reality of Greater Jerusalem,” said Hawari. Shuafat is the only Palestinian refugee camp in Jerusalem and is home to around 23,000 people. An eight-metre high concrete wall circles the camp, cutting it off from the rest of the city. The camp is part of Jerusalem Municipality, yet no municipal or governmental services are provided here. UNRWA has provided the most basic services thus far. “It [the demolition] is to tighten Israeli control over Jerusalem,” said Khader Dibes, a resident, who agreed with the PLO’s statement. Jerusalem municipality workers entered the camp for the first time last month and removed waste, raising eyebrows for many that this was a first step towards replacing UNRWA. In the same month, 50 Palestinian structures were demolished in the occupied West Bank, displacing 43 people. Since 1967, more than 48,700 structures have been demolished in the occupied Palestinian territories. The neighbourhoods of Ras Shehada, Ras Khamis, Dahiyat as-Salam, on the other side of the wall, lack municipal services as well. “If the municipality wants to serve the public, it wouldn’t make a wall, it wouldn’t put a checkpoint to stop me from entering my city, it wouldn’t put obstacles for women and children,” Thaer Fasfous, spokesperson for the camp’s Fatah movement, told Al Jazeera. Next articleRobert Kubica: How did he return to F1 after a life-changing injury?